Easter is almost here and without taking away from the actual significance of the day, we think it's a great time to get into the spirit with chocolate feasts and bunnies galore! We all know that chocolate is not allowed for pets on Easter, but that doesn’t mean there isn’t other great ways to let your pet have some fun! Take our 10 second survey and tell us how you'll be celebrating Easter with your pet and you'll go in the draw for a chance to win 1 of 3 Easter treat baskets worth over $50 each, so hop to it! 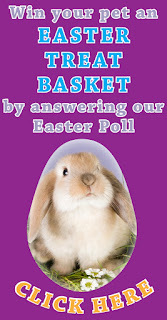 Click here to answer the Easter Poll Now!